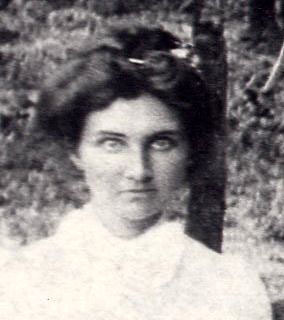 Mary Emaline Knight, daughter of James Monroe Knight and Eliza Jane Abernathy. The end came quietly and peacefully for Miss Molly Knight, 65, beloved Bartow County resident, who died at her home in the Stamp Creek district at an early hour Saturday morning after a long illness. Miss Knight was one of Bartow County’s best known residents, a member of one of the county’s most prominent families, and having made her home here all her life. Impressive funeral services were conducted Sunday morning at eleven from the Macedonia church. Rev. M.W. Hart, a lifelong friend of the family, officiating in the presence of a large following of sorrowing relatives and friends. 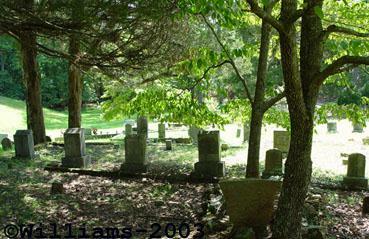 Interment was in the family lot of the church cemetery; the following close friends serving as pallbearers: Messrs. Harry Galt, Nathan Newberry, Carl Culver, J.F. Harris, John Cox and Ernest Knight. Owen Funeral Home was in charge of arrangements. 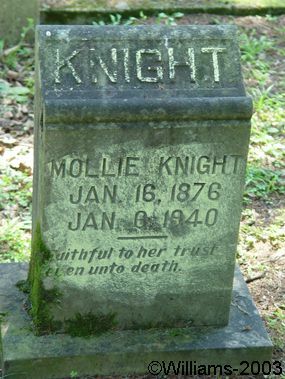 Born in Bartow County January 16, 1876, the deceased was a daughter of the late J.M. and Eliza Abernathy Knight, prominent pioneer residents. She made her home here all her life, winning a legion of friends, who are grief-stricken over her passing. Loyal, loving, and indulgent, Miss Knight’s passing is keenly felt by all who knew her, and tenderest sympathy goes to members of the bereaved family in their great loss. An upright Christian, she had been a member of the Baptist church since girlhood. Survivors include four brothers, Messrs. J.A., W.L., Wesley and Joe, all of Cartersville, and one sister, Mrs. Lucy Crisp of Acworth. We want to take this opportunity of expressing our heartfelt thanks to our many friends for the many acts of kindness and words of sympathy during the illness and death of our beloved sister. May God bless you each and every one.